Tardis Shadow Box Custom Frame There are 27 Reviews. 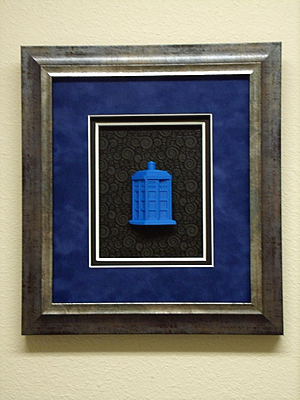 The Tardis Shadow Box Custom Frame is 1 of a kind...literally! Seriously, we won't be making another one of these! However, this Tardis is quantum time locked inside a glassless shadow box. * The Tardis extends out of the back of the frame creating shadow box depth. * The black back mat shines to reflect the swirls from different angles. * Each layer of matting is floated above the next to create additional depth. * The custom built frame is one of a kind! The frame itself has 2 layers of beveling. The 'silver' looking small bevel is silver due to the angle the light is hitting it at. The thick outer layer of the frame has a silvery blue tinge giving it that "something borrowed, something blue" weathered look.